Dummy News and Views is the newsletter of the Dummy Stamps Study Group. The newletter is published quarterly and available as a free download. Click Here. The number of members in the Dummy Stamps Study Group (DSSG) remains at about 25. A few new members joined in 2011. Most contact is by email with snail-mail correspondence as necessary. There is frequent communication between members sharing information that is encouraged and helpful to all. The DSSG continues to work on two research paper projects: 1) updating Research Paper Number 3 – Dummy Stamp Booklets, and 2) compiling a comprehensive illustrated listing of the different defacement lines on the black “For Testing Purposes Only” coil, Scott #TD107b. Proposed future projects include: 1) producing a listing of all known dummy/test stamp references; 2) compiling a listing of all known dummy/test stamp auction appearances, including prices realized when available; 3) compiling a listing of all known dummy/test stamp complete roll sizes and illustrations of the box and roll labels; and 4) compiling a listing of the frequency of joint lines or plate numbers on test coils. Information that will help the DSSG on any of the above projects is most welcome. DSSG member Joann Lenz and her husband Kurt Lenz showed a single frame exhibit of dummy/test stamps last year at the A.P.S. StampShow 2011 in Columbus, Ohio and won the Single Frame Grand Award for their exhibit titled “U.S. 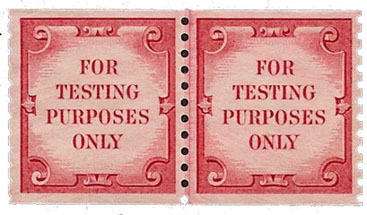 Test Stamps Related to the B.E.P. (ca. 1907-1959).” This is a fantastic exhibit of early United States dummy/test stamps. There are links to the exhibit pages in the Summer, 2011 Dummy News and Views newsletter of the DSSG. The newsletter can be found at //www.usstamps.org/dssg.html along with all other newsletters. The DSSG publishes a quarterly newsletter. All completed newsletters are available for download at the DSSG web site. Notification is sent to DSSG members and other test stamp collectors when a new issue of the newsletter is posted. If you do not currently receive the newsletters and wish to be added to the list to receive these newsletters, please contact me by email. DSSG member Joann Lenz maintains a website related to dummy/test stamps at: Dummy Stamps – An Introduction. Another DSSG member, Eric Olson, also maintains a web page pertaining to dummy stamps. It may be found at: www.star-bits.com/dummystamps.